I think late September and October are awesome for multiple reasons, but the weigh-offs can make them amazing. Great weather, football, and the winding down of another pumpkin season really caps off the fall. I'm not taking my pumpkin to the Jared's Nursery weigh-off tomorrow, but I thought I would talk about what the night before a weigh-off is like and give some advice to newer growers. First thing, make sure you load up your pumpkin tonight! Don't wait until Saturday morning to load up the pumpkin. Too many things can go wrong and you don't want to wait until morning to have the pumpkin loaded. Along with that, put the pumpkin on a pallet so it can be easily unloaded at the weigh-off. Also, leave a little of the vine on the stem and attach a water bag to it. You can gain a few extra pounds that way. Second, make the pumpkin loading experience a party. 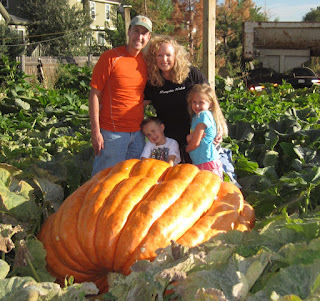 My first year I had a 755 pound pumpkin in the patch and I wasn't sure how I was going to load it up. I got my self a lifting tarp and then invited a bunch of friends to a "pumpkin party" which was my rouse to get a bunch of strong guys to come over and get the pumpkin on a pallet on a trailer. The next year, everyone was asking if they could come to the pumpkin party so it has become an annual event, even though we now use backhoes to lift the pumpkins. There is a lot of hard work in growing a pumpkin. Too many hours to count. So celebrate the cutting of the vines with friends. Honestly, they seem to love to come see the pumpkin every year. Third, enjoy the weigh-off! Again it is a celebration, regardless of how big your pumpkin has grown, so enjoy the time with the other growers and ask the better growers lots of questions. You'll get advice that will probably add hundreds of pounds to your pumpkin the following year. No pumpkin is too small for the weigh-offs if you tried as hard as you could try. Fourth, you may find yourself strangely anxious as your pumpkin goes to the scale. Even the years that I thought my pumpkin was small, I hoped for the best. Nothing wrong with that. Sixth, be prepared for your pumpkin to weigh less than you hoped. This can be a very hard thing. Especially if you thought you had a personal best going to the scale. The estimation charts are just that: "estimations." Not only that, they are an average. Which means 50% of the pumpkins are going to go heavy and 50% are going to go light. Remember you've already got a 50% change of going light, so expect it and then be surprised if it goes heavy. 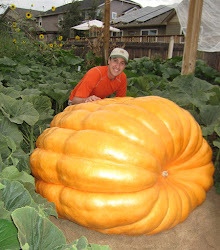 Two years ago, I grew what was the 2nd biggest pumpkin ever grown in Colorado in terms of the inches. It was a fun season. However, on the scale, the pumpkin ended up 18% light. That is massively light. 7% below the charts would be considered a lot light and I couldn't have been prepared for 18%. It kind of hurt at the time. By the next day, I realized I had grow a pumpkin that was hundreds of pounds bigger than anything I had grown before that was a personal best. That made if feel better, so keep everything on the positive side. Some things aren't in your control. Enjoy the weigh-offs and may all of your pumpkins go heavy! Go see one of the RMGVG weighs this fall and see pumpkins over 1,400 pounds. If you visit jareds today can you post the leader when they are done for those of us who couldn't make it Jamie ? ?thanks !! !